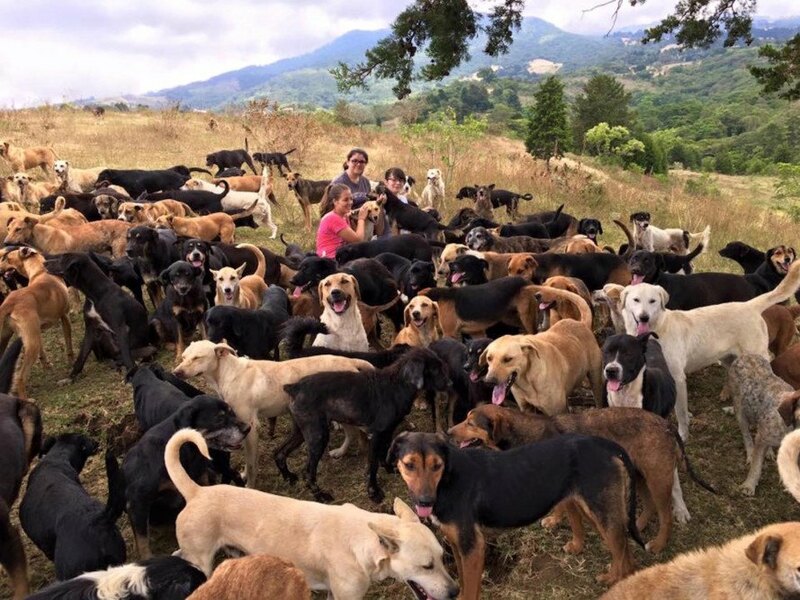 Costa Rica offers more than just pristine beaches and stunning surf—the tropical country is also home to a dog and dog lovers’ paradise filled with nearly 1,000 happy and healthy dogs. 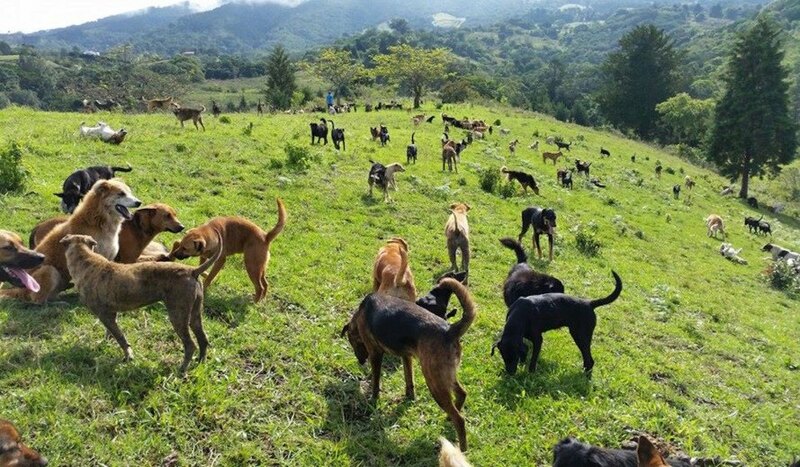 Founded as a no-kill shelter and haven for strays, the volunteer-run Territorio de Zaguatas—the Land of the Strays—is located on the green pastures of Santa Bárbara in Costa Rica’s Heredia province. The sprawling free-range doggy heaven runs an active adoption program, but also invites curious visitors and dog lovers to come for a free hike and to play with the dogs. Founded nine years ago by a couple passionate about animal welfare, Territorio de Zaguatas is a non-profit organization that operates with help from donations, volunteers, and a small but hardworking staff. The Super Perro dog food factory donates approximately 80% of the dog food. All dogs are spayed/neutered, vaccinated, and treated for parasites before they enter the sanctuary. Dogs of all sizes and breeds interact freely on the haven’s giant property. Each dog is given a name and is even assigned their own personal “breed” based on their characteristics. Staff members who watch over the dogs 24/7 make sure to break up any fights and maintain safety among the pack. A modern indoor facility offers soft bedding as well as feeding and bathing stations. Troughs of water are placed in multiple locations throughout the property. While Territorio de Zaguatas is free and open to the public, interested visitors must first call in advance—(506) 8883-9337—to schedule a visit or they can check the Facebook page for upcoming public hikes. Though volunteers regularly come to exercise the dogs, this steadily expanding doggy heaven requires donations to survive; all donation options can be seen on the Territorio de Zaguatas Facebook page. Founded nine years ago by a couple passionate about animal welfare, Territorio de Zaguatas is a non-profit organization that operates with help from donations, volunteers, and a small but hardworking staff. The Super Perro dog food factory donates approximately 80% of the dog food. All dogs are spayed/neutered, vaccinated, and treated for parasites before they enter the sanctuary. Dogs of all sizes and breeds interact freely on the haven’s giant property. Each dog is given a name and is even assigned their own personal “breed” based on their characteristics. A modern indoor facility offers soft bedding as well as feeding and bathing stations. Staff members who watch over the dogs 24/7 make sure to break up any fights and maintain safety among the pack. While Territorio de Zaguatas is free and open to the public, interested visitors must first call in advance—(506) 8883-9337—to schedule a visit or they can check the Facebook page for upcoming public hikes. Though volunteers regularly come to exercise the dogs, this steadily expanding doggy heaven requires donations to survive; all donation options can be seen on the Territorio de Zaguatas Facebook page.